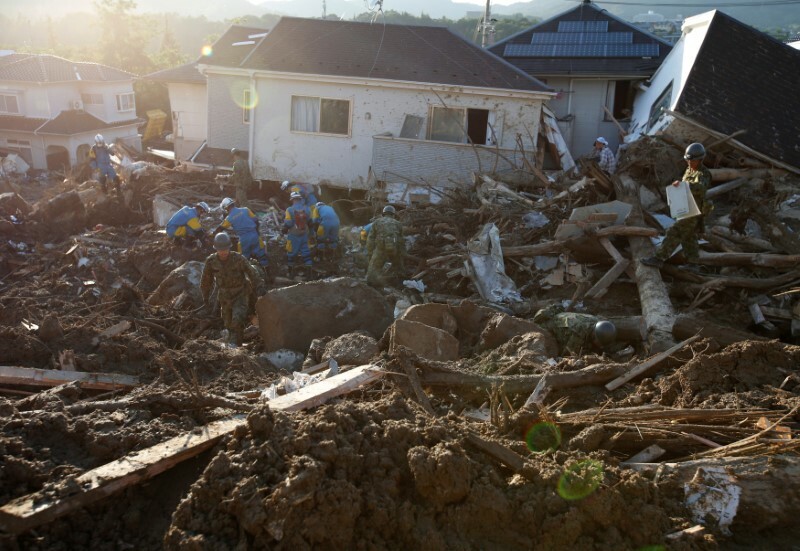 KURASHIKI, Japan (Reuters) – Japan risks more severe weather and must find ways to alleviate disasters, a government spokesman said on Thursday, as intense heat and water shortages raised fear of disease among survivors of last week’s floods and landslides. Torrential rain in western Japan caused the country’s worst weather disaster in 36 years, killing 200 people, many in communities that have existed for decades on mountain slopes and flood plains largely untroubled by storms. But severe weather has been battering the country more regularly in recent years, raising questions about the impact of global warming. Dozens of people were killed in a similar disaster last year. “It’s an undeniable fact that this sort of disaster due to torrential, unprecedented rain is becoming more frequent in recent years,” Chief Cabinet Secretary Yoshihide Suga told a news conference in Tokyo. Saving lives was the government’s biggest duty, he said. “We recognize that there’s a need to look into steps we can take to reduce the damage from disasters like this even a little bit,” he said. He did not elaborate on what steps the government could take. More than 200,000 households had no water a week after disaster struck and many thousands of people were homeless. With temperatures ranging from 31 to 34 Celsius (86 to 93 Fahrenheit) and high humidity, life in school gymnasiums and other evacuation centers, where families spread out on mats on the floors, began to take a toll. Television footage showed one elderly woman trying to sleep by kneeling across a folding chair, arms over her eyes to keep out the light. With few portable fans in evacuation centers, many survivors waved paper fans to keep cool. Tight water supplies meant that people were not getting enough fluids, authorities said. The government has sent out water trucks but supplies remain limited. In the hard-hit Mabi district of Kurashiki city in Okayama prefecture, piles of water-damaged refrigerators, washing machines and furniture lined the streets as residents used hoses to wash mud out of their homes. Unable to join in the strenuous work Hisako Takeuchi, 73, and her husband, spent the past five nights at an elementary school that had been turned into a make-shift evacuation center. “We only have each other and no relatives nearby. We aren’t able to move large things and we desperately need volunteer helpers,” said Takeuchi. 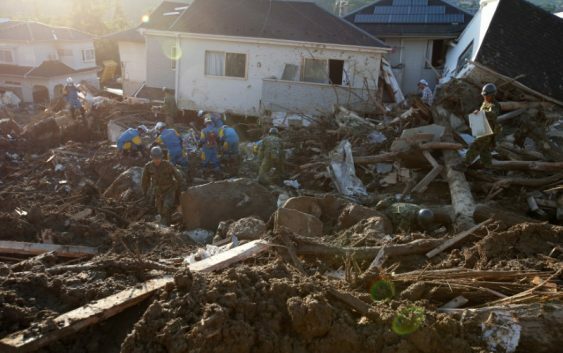 Prime Minister Shinzo Abe, on a visit to Kurashiki on Thursday, promised to provide help as soon as possible. He is set to visit two other hard-hit areas on Friday and the weekend. More than 70,000 military, police and firefighters toiled through the debris in a search for bodies. Teams used diggers and chainsaws to clear landslides and cut away wreckage of buildings and trees. Many areas were buried deep in mud that smelled like sewage and had hardened in the heat.